This week supporters of Unity and friends held a day long protest at the UK Border Agency reporting centre at Brand Street in Glasgow. 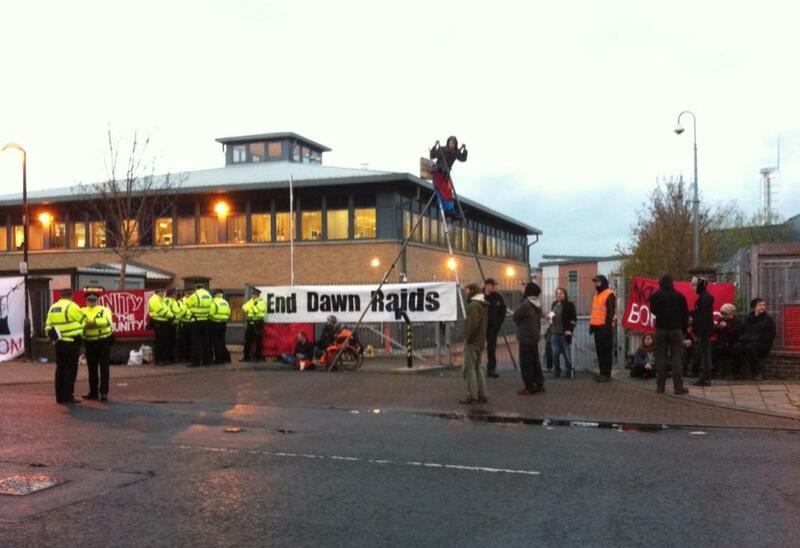 Early in the morning on Monday 21 November, a group of people used a tripod to block the vehicle entrance and three demonstrators locked to gates, shutting the vehicle entrance and preventing any ‘dawn raids’ that would have happened that morning. The action was carried out in response to a return to the bad old days of dawn raids on the streets of Glasgow – following several dawn raids on the homes of asylum seeker families in the past few months – and to the continued practice of detaining children. In a dig at the UKBA’s attempt to justify their inhumane practices, one of those involved in the blockade said, “We have given them every chance to end this abhorrent treatment of families voluntarily. Unfortunately, they refused to take these opportunities, and our last resort is direct action “. At 10am, a lively demonstration arrived at Brand Street, with participants from the No Borders Network, Peace & Justice Scotland, Glasgow Campaign to Welcome Refugees, NCADC and the Govan & Craigton Integration Network as well as individuals registering their objection to dawn raids. The demonstration continued all day, with police unable to remove the tripod, and ended at 5pm when the reporting centre closed for the night. A magnificent 11-hour blockade!